2. Chabad operates two early childhood centers in the city, Ilana and Beit Tsindlicht. The Ilana center, named in memory of a former participant who died as a young child, enrolls about 35 children between the ages of one and three in a daycare program. Beit Tsindlicht is a much larger endeavor, hosting 157 children between the ages of 2½ and six in a formal preschool program. The family of Victor Pinchuk, a native of Dnipropetrovsk who now lives in Kyiv, provided funding for Beit Tsindlikht, which is named in memory of Mr. Pinchuk's maternal grandparents. 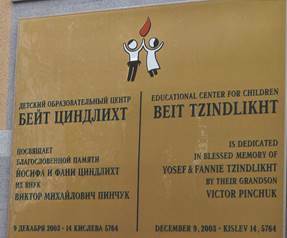 A plaque on the Beit Tsindlikht building memorial-izes Victor Pinchuk's grandparents. Mr. Pinchuk is an oligarch with major interests in iron, steel, and communications. He is married to the daughter of Leonid Kuchma, a past President of Ukraine. Each of the two centers operates a daylong program, serving three full meals and a snack. The official monthly tuition at each is 2,000 hryvnia ($170+ in mid-2014) for children whose families are employed by Chabad. However, said Yudit Baram, the director of Beit Tsindlicht, the majority of families pay only an unofficial minimum of 50 hryvnia (about $43 in mid-2014). Only 15 families pay more than the minimum. The 157 children at Beit Tsindlikht are placed in one of six sections based on age, language preference (Russian or Hebrew), and religious background. 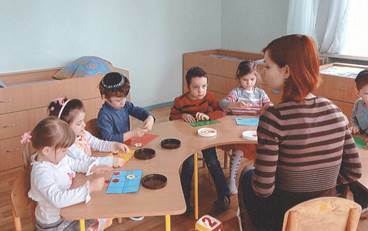 Many of the Chabad families are Israelis and prefer that Hebrew be the primary teaching language, said Ms. Baram; thus, all children from religiously-observant families are in Hebrew- speaking classes, and most local children, who usually are from less traditional families, are in groups that use Russian as the primary language. 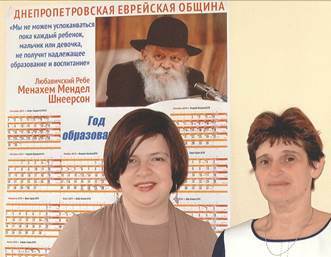 Yudit Baram, left, and Elena Krasnova, at right, stand in front of a Chabad school calendar. Ms. Krasnova is principal of the local Chabad elementary school, School #144. (See below.) The calendar quotes R. Menachem Mendel Schneerson as say-ing, "We are unable to rest as long as any boy or girl is not receiving a proper [Jewish] education and upbringing." About 90 percent of the local children are halachically Jewish, stated Ms. Baram. The remainder have some Jewish heritage and all of their families maintain a substantial connection to the broader Jewish community. Each of the six groups of children includes between 23 and 27 youngsters, three certified teachers, and one or two assistant teachers. Beit Tsindlikht uses standard Ukrainian workbooks in the secu- lar studies portion of its curricu-lum. Most of the teachers, said administrator Natalia Kozarinskaya are local women, many of whom are graduates of Beit Chana. Some are Israelis, who have completed training at Chabad teachers colleges in Israel. The majority of youngsters continue on to School #144, the local Chabad day school, most local children enrolling in the regular day school and most children from religious families go into the yeshiva katana or the machon. (See below.) Ms. Kozarinskaya stated that some local non-observant families face a real dilemma in deciding whether to continue their children's education in a Chabad environment or to transfer to elite, private schools that are more prestigious. About two or three graduates of each Beit Tsindlikht class enroll in such private schools for elementary school. However, she noted, the culture of Beit Tsindlikht encourages continuation in the Chabad system. 3. School #144, which bears the formal name of Levi Yitzhak Schneerson Ohr Avner Jewish Day School, occupies a three-building campus that served as a boarding school during the Soviet period. 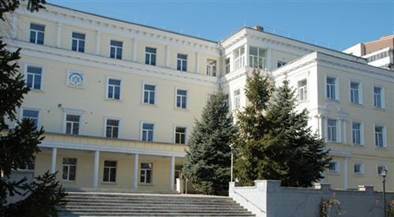 In all, the premises currently accommodate 400 youngsters, of whom 285 attend grades one through 11 (the conventional Ukrainian system) in the main building. The enrollment has increased by 22 students over the previous year. The school now is directed by Elena Krasnova, a new principal expected to raise its academic standards from its current rather mediocre standing to a more elevated level competitive with the city's best schools. Most youngsters at School #144, Ms. Krasnova stated, come from Russian-speaking homes. However, she continued, the use of Ukrainian at home is increasing every year among school families. The school also enrolls "one or two" Israeli children at every grade level, most of whom are from emigré families who have returned to Ukraine. Although these youngsters spoke some Russian at home, they generally don't speak it very well, she said, and their skills in reading Russian are even more limited. School #144 schedules eight class periods every day. Youngsters in grades one through five have four classes in Hebrew and two in Jewish tradition each week; students in grades six through 11 have three classes in Hebrew each week and two in Jewish tradition. Ms. Krasnova noted that the school uses the Tal Am/NETA Hebrew curriculum, which is geared more toward English-speaking students and is not entirely satisfactory for youngsters whose native language is Russian or Ukrainian. Further, she stated, the school cannot afford to purchase the textbooks that have been published for this program, so it must download the electronic version, which causes other problems. She also noted that Hebrew is the fourth language - after Russian, Ukrainian, and English - pursued by youngsters in school; three to four classes weekly in Hebrew is insufficient to master the language, but the crowded school curriculum does not permit the daily exposure that is desirable. The main building of School #144 is seen at left. The girls' machon is behind this structure and the boys' yeshiva katana is to the left. The school is equipped with two ORT-equipped computer laboratories and schedules four class periods per week in informatika for all students. School #144 youngsters have done well in ORT interschool competitions, including some held in Israel. Robotics is among the most popular components of computer studies, Ms. Krasnova said. She described the overall quality of the ORT computer program as "excellent", and stated that cooperation between the school and ORT was at a high level. Ms. Krasnova noted that city teachers of computer studies train at the School #144 ORT labs. In response to a question about afterschool activities, Ms. Krasnova said that the afterschool program was limited by budgetary constraints and bus transportation schedules. However, some students train for interschool competitions in informatika and mathematics during afterschool hours. Such supplemental training is absolutely essential for success in these contests. When weather permits, some pupils participate in outdoor sports in the school yard. Ms. Krasnova observed that the school needs a modern sports hall that can be used for a full range of indoor sports, including both daily exercise and afterschool activities. The small gym in the yeshiva building is very inadequate. She also would like to develop the School 144's technology base, beginning with the installation of more smart boards. In a later discussion, an experienced teacher in the Chabad school system commended Ms. Krasnova for her professionalism, noting the she had much more school administration experience than her predecessors at the helm of School #144. Zelig Brez, Executive Director (Исполнительный директор) of the Philanthropic Fund of the Dnipropetrovsk Jewish Community (Благотворительный фонд Днепропет-ровского еврейского общины), which supports Chabad interests in the city, stated that the school had begun a three-year evaluation process to measure progress in achieving community goals for improving academic achievement. Their goals were objective and measurable, he said; Ms. Krasnova's appointment was one of several significant staff changes, he continued. Among additional measures, said Mr. Brez, the school day had been lengthened and the number of school holidays reduced. Attaining the desired level of academic excellence will take time, he observed. In total, said Ms. Levin, the machon employs 40 teachers, including a psychologist and a number of specialists who work on a part-time basis. Twelve of these teachers, most of whom are Israelis, are instructors in religious subjects. Twenty-seven class hours each week are assigned to secular studies, and 17 to Jewish studies (including Hebrew). The Jewish studies curriculum is expanded slightly in sixth grade when girls prepare for their Bat Mitzvahs, noted Ms. Levin. In response to a question, Ms. Levin acknowledged that machon pupils have no access to science laboratories, but they do watch teachers conduct modest experiments. Machon pupils are instructed in computer technology, and participate in exercise and dance classes in a small studio. Following completion of the machon curriculum, all local girls enroll in local universities or other post-secondary programs. The Chabad girls attend various Chabad seminaries, usually in Israel. 5. The writer was unable to visit the yeshiva katana (small yeshiva or junior yeshiva) that is housed in a separate building on the School #144 campus. Its curriculum resembles that of a mesivta, in that it includes both secular and religious studies rather than focusing almost exclusively on Jewish subjects. Both city boys and boys from religious families attend the school through seventh grade. In eighth grade, boys from Chabad homes begin studies at a Chabad residential yeshiva katana, which opened in the 2013-2014 academic year. (See below.) The launch of the new institution led to cancellation of the existing eighth grade boys program as too few city boys remained for its continued operation. The long-term impact of the residential yeshiva katana on the School #144 yeshiva middle and upper grades was uncertain at the time of the writer's visit to Dnipropetrovsk. 6. A residential yeshiva katana opened at the beginning of the 2013-2014 school years, initially enrolling eight boys (later joined by a ninth boy) in the equivalent of eighth grade. The yeshiva will add one class in each of the next two years so that it eventually serves boys ages 13 through 15/16 years old in classes corresponding to eighth, ninth, and tenth grades. The program is located in a leased building, originally intended as a country home, in a small town between Dnipropetrovsk and Zaporizhzhia. The curriculum includes Chabad religious study exclusively, with no secular subjects. The primary constituency for the residential yeshiva is Chabad emissary families in Ukraine, but even in its first year the program attracted a Chabad youngster from England. Its location in the center of an area with deep roots in Chabad history is a major draw to some Chabad families. 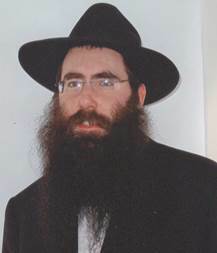 Australian-born Rabbi Chaim Chazan was recruited by Rabbi Kaminezki, Rabbi Meir Stambler, and Rafael Rutman, a British-born Kyiv businessman, to head the residential yeshiva katana. Rabbi Chazan attended yeshiva in England and, prior to accepting the position in Ukraine, had taught in similar yeshivas in the United States. Rabbi Chaim Chazan, director of the yeshiva, stated that his vision for the residential yeshiva katana is an eventual enrollment of 60 boys, that is, 20 boys at each of three grade levels. He referred to a mission of inreach, providing support to Chabad emissaries working in Ukraine. These emissary families are his first responsibility, he continued; when space and experience permit, he will welcome boys of other backgrounds. Perhaps the yeshiva will become an important address for Jewish education throughout Europe. When asked about the appeal of working with this particular age group, Rabbi Chazan responded that boys between the ages of 13 and 16 are receptive to new ideas and often experience significant gains in intellectual growth. They also mature in personal philosophy and conduct. By the time boys reach age 17, he said, it often is too late to instill responsibility and other positive behaviors. He would like to nurture boys to become steeped in Chabad values and practice. He derives enormous gratification from seeing boys change and mature before his very eyes. For a discussion of the academic standing of School #144, see the writer's most recent previous report Observations on Jewish Community Life in Ukraine - Report of a Visit in April 2013, pages 45-47. Ms. Krasnova served as principal of another Dnipropetrovsk school for 14 years. In response to a question, she said that the other school was better equipped with computers and additional modern technology, but it also had many problems. The ORT curriculum in School #144 is under the general supervision of Natalya Medvedeva, who directs ORT programs in the city as a whole. For information about other ORT activity in Dnipropetrovsk, see pages 29-30.